Team-ups are a time-honored tradition in comics. So its apropos that we celebrate the wrap of NEXT-DOOR NEIGHBOR, SMITH’s true-life webcomic anthology edited by Dean Haspiel, with not only a proper party, but a team-up of our own. Media theorist/author/longtime friend, Doug Rushkoff, has just launched his new book, LIFE INC: How the World Became a Corporation and How to Take It Back, and we can’t think of a better project to join forces with. That’s why SMITH, along with WFMU and ARTHUR Magazine, is toasting the wrap of NDN and launch of LIFE INC with a party on Thursday, June 18, at Sutra Lounge in NYC at 9pm. Facebook invite here you come! Doug’s book reveals how we’ve been corporatized to the point that we don’t realize that our “money” isn’t actually the only form of currency, that we can create value for each other numerous ways, person-to-person, with numerous forms of “complementary currency” (e.g. doing things for each other and our communities). At SMITH, we like to consider the personal stories told by our community as our currency, buying your attention, as collective value is created by sharing wisdom, knowledge, laughs and tragedies in carefully crafted stories, comics and even Six-Word Memoirs. Doug’s book celebrates, from an unexpected angle, human connection and value creation, unmediated by a brand or corporation, and from this point of view, shows how our economic shithouse may just be a blessing in disguise. For a preview, watch this video of Doug digging into his idea below. It so happens Doug’s wife Barbara Rushkoff wrote one of the most popular NDN stories, “Glenna Evans,” which makes our mashup soiree that much more …mashable. 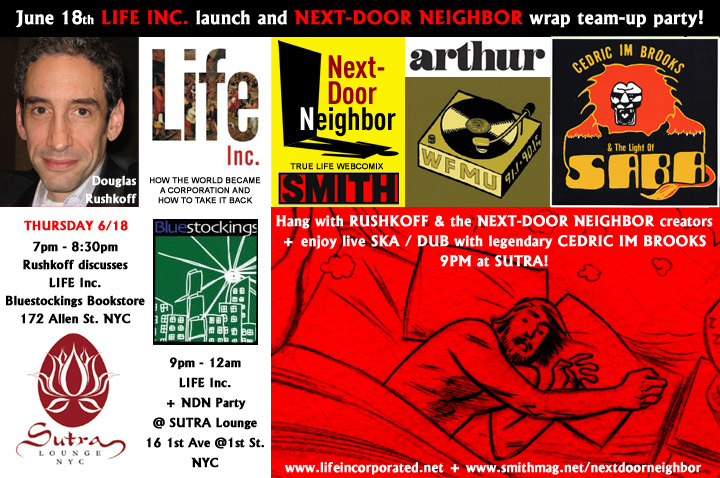 Join us 6/18, first at Bluestockings Bookstore where Doug will be discussing LIFE INC, and then for the party at Sutra Lounge, where you can meet and chill with Rushkoff, Haspiel and many NDN creators. The legendary Cedric IM Brooks amd some of his pals from the Skatalites who will be vibin’ us with jazzier Nyabinghish versions of the tunes they tour the world with, just for this occasion. Again, here’s the invite on our BFF, Facebook. Jct: Best of all, when the local currency is pegged to the Time Standard of Money (how many dollars/hour child labor) Hours earned locally can be intertraded with other timebanks globally! In 1999, I paid for 39/40 nights in Europe with an IOU for a night back in Canada worth 5 Hours. Thank you for good this post. Amazing article my friend good job. I like this title next door i will try this techniques thanks man. This might be just what I was looking for! I really appreciate your work and I’m waiting for your next article. Thanks for a awesome post. Greetings from New Hampshire!